Outlandish Observations: New cover art for the Lord John books! Great news for Lord John fans today! 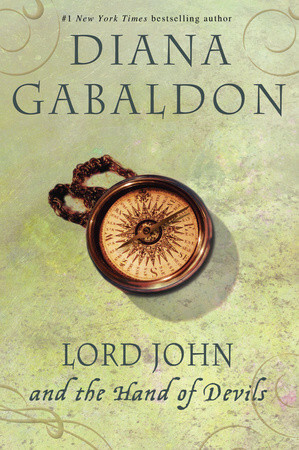 Random House (Diana Gabaldon's US publisher) has just released a new cover for the paperback of LORD JOHN AND THE BROTHERHOOD OF THE BLADE. I love the look of this cover. It's SO much better than the "eyes" on the old Lord John covers. 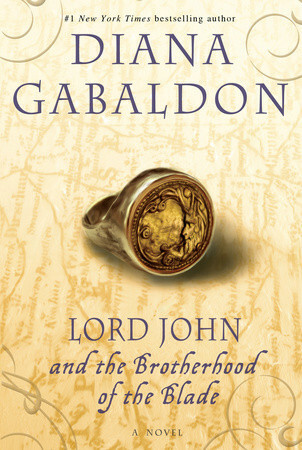 And there's Lord John's smiling half-moon signet ring, which is a very appropriate symbol for this book. It's also quite obvious that this cover art is intended to coordinate with the SCOTTISH PRISONER cover. I knew that Diana was soliciting ideas for new cover art for the Lord John books on Compuserve a few months ago, but quite honestly I had forgotten all about that, until I saw the picture just now. It looks great, and now I'm really curious to see what the other covers will look like! I'm _really_ pleased with the new cover art for the Lord John books. The others--PRIVATE MATTER (a couple of antique medicine bottles) and HAND OF DEVILS (an antique compass <g>)--are done in a similar style, with a pale granular background and scrolled corners. Really nice! If you want to tell Diana what you think about the new cover art, there's a thread on Compuserve here. UPDATE 3/30/2012 2:35 pm: Here is the new cover art for LORD JOHN AND THE HAND OF DEVILS. Diana has posted the new cover for LORD JOHN AND THE PRIVATE MATTER on Compuserve, but it should be up soon on Amazon and elsewhere. The compass for HAND OF DEVILS was my suggestion (because I love the compass needle imagery, with "you are true North", at the end of "Haunted Soldier"), and I'm thrilled to see that Diana chose that as the symbol for this book. I do like these better than the eyes. I always thought they were too old for Lord John. Thank you for your posts and Friday FF. Since no one I know "gets it", I appreciate the connection with other Outlander series lovers that your blog enables.